Some of the most important ecological research taking place today is in field studies in plant ecology. These are studies undertaken to answer such important questions as: How much carbon dioxide do plants take up from the atmosphere? Does the number of plant species in a community such as a prairie or forest affect productivity? How much carbon dioxide is taken up by these communities? Why do some plant communities such as tropical forests have so many species, whereas others like salt water marshes have so few? What effects are introduced species having on native plant communities? Although laboratory experiments are useful in trying to understand how individual plants respond to different conditions, only studies conducted in the field can answer questions such as these. 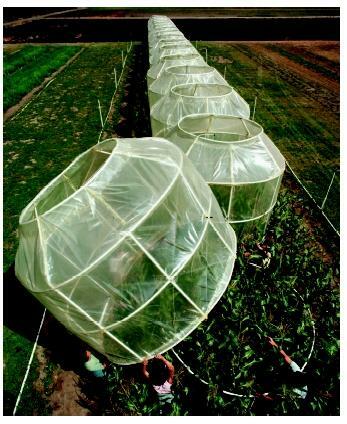 Agronomists place a plastic greenhouse over crops that will be exposed to simulated rain with varying pH levels. The greenhouse provides a closed environment that will allow scientists to assess the plants' reaction to the rain. in which the investigator manipulates only a single or a few variables, such as fire frequency. The advantage of field experiments over strict observational studies is that the investigator has more control over the variables of interest, and hence it is often easier to test specific hypotheses. The potential pitfall of field experiments is that the investigator may so alter the natural environment that the findings may not be relevant beyond the experiment itself. Often, scientists will employ both field experiments and field observational studies in order to answer important plant ecological questions. Field studies in plant ecology serve two major purposes. First, they help researchers understand how the natural world functions, thereby satisfying human curiosity. Second, they provide information that can be of great practical value. For example, some plant studies show how plant species are affected if their habitat is reduced in size. Others show how certain plant species are dependent on particular animals for their pollination or seed dispersal. These findings aid conservation biologists who are trying to preserve plant species diversity in natural areas and in urban and suburban environments. Many ongoing field plant studies are trying to increase scientists' understanding of global climate change. It is hoped that findings from these studies will help scientists better predict the nature and extent of future climate change. In turn, these field studies may show how changes and elimination of plant communities (for example, through deforestation and urbanization) might be affecting global and regional climate patterns. Grime, J. P. Plant Strategies, Vegetation Processes, and Ecosystem Properties, 2nd ed. New York: Wiley & Sons, 2001.